Although there are several online undergraduate programs that offer advertising coursework, few are as extensive and flexible as those found in online graduate programs. The diversity of existing advertising possibilities allows interested students a variety of academic avenues to pursue. From traditional forms of promotion, such as print, radio and television, to recent developments in Internet communications, there is no shortage of educational possibilities in this field. A wide variety of degree programs offer significant advertising coursework. Examples include the Associate of Arts in Internet Marketing, Bachelor of Fine Arts in Advertising and Master of Arts in Communication programs. Graduates of these programs can find employment with marketing firms, public relations agencies and press offices, as well as within the communication and advertising departments of major corporations and non-profit groups. Online employment opportunities involve Internet promotions, marketing and analysis, and keyword and search engine optimization. Below is a sample of some of the advertising courses that are commonly offered online. Fundamentals of Advertising Course: Providing a general marketing overview, this course examines the use of suitable integrated advertising practices in local, regional, national and international markets. Students learn the inner workings of advertising agencies and their promotions. Topics include copyright issues, the influence of digital technology, and the ethics of running a media campaign that leverages consumer prejudice and behaviors to sell goods and services. Branding and Advertising Course: This course explores the mechanics of effective branding and advertising operations. Students learn to create and develop a branded product and expand consumer awareness through advertising campaigns. The necessary practices of organizing a creative department, establishing realistic timelines and budgets, and determining the appropriate media venue for launching an advertising campaign are central to this class. Corporate and Non-Profit Advertising Course: Students in this class learn that sustaining an organization's bottom line requires a continuous stream of marketing campaigns to keep the company in the public eye. The course examines how corporations and non-profits are similar, requiring effective media strategies to persuade potential consumers or donors to support the client's business or agenda. Students look into the creative processes and branding skills necessary to produce a media campaign strong enough to leave an indelible impression upon the public conscience. Internet Advertising Course: The Internet has changed how communication professionals approach advertising in the digital age. 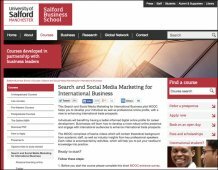 Students in this course explore effective avenues to connect potential customers with the goods or services they want by advertising through credible websites, blogs, social networks and journalistic sites. New research and marketing techniques, such as data mining and search engine optimization, are also addressed. The Art of Persuasion Course: Students in this course explore the empirical evidence behind the art of persuasion. The class examines how a presenter's apparent knowledge, honesty or likeability affects the psychology of the target audience and how the sequencing of ideas using humor and fear can provide maximum impact. Art Direction Course: This course provides students with a strong foundation in skills needed for art direction. Topics will include font choice, layout, applicable advertising history and general art direction responsibilities. Artwork Description Poster advertising Bibby Line short sea cruises, showing some glamorous people strolling around the deck in their evening dress. Casters Realm is a Massively Multiplayer Online Gaming Website network that is owned and operated by The Underground Online (UGO) Network in New York. @DarkestKale You've inspired me to at least put all my job advertisements online. Start attracting some artist interest. Thanks!